I knew this about David when we moved in together. I was aware. Me: I slam a box full of crap into the car and get in the passenger seat. David: Looks at me with complete disdain. “Do you even know what was in the box under the one you just slammed on top of it? David: “No. It’s not,” he says, as he points to the now de-spiked figure of a Japanese dragon his parents brought us from Japan last summer. Me: Don’t be so uptight. Then, there was the couch. We loved our couch. We did. Apparently, people these days don’t need couches. People are all set with couches. So, after a month of posting on Craigslist, one potential scammer, two price reductions, and several emails with slightly interested buyers, we decided to give it away. I called Salvation Army. They didn’t have room for a couch. I called the Hoboken homeless shelter. They told me to call social services. I called social services. They told me to call Salvation Army. This 9ft beast was starting to get to me. By this time, the girl who moved into our room sent us an email and told us to quit being “ignorant” and get the couch out of the apartment. Wonderful. Monday. We decided to do what any self -respecting citizen would do. Put it on the curb and drive away quickly. It was pouring, but David was going to pick me up from work and we were going to carry it outside. David got into a car accident leaving Newark, so… This made the week..stressful. He’s okay…the car isn’t. Tuesday. I recruit three of my co-workers, and as we try to get this beast out of our old apartment my old landlord knocks on the door. Wonderful. We scratched the wood. We scratched the floors. We barely got it out the door. We set it in front of the strip of stores next to our old building and….walked away very quickly. I am happy to say we are fully moved in. We are bumming it around Park Slope finally feeling like our apartment is ours. I don’t want to move for a long time. As promised, here are some pics of the process. Don't the shelves look a-mazing?? More to come. Below is a recipe from Ellie Krieger, one of my new favorite cookbook authors. I saw this magazine (goodbye Jersey City A&P) in the grocery store and ended up shopping for ingredients for the recipes right then and there. It's easy and low fat, as are most of Ellie's recipes. woo. Bikini season. The key to this pizza is cooking the onions very slowly over low heat so the sugars develop and caramelize. Their sweet flavor and purple color is the perfect foil for the peppery ribbons of arugula and tangy, creamy goat cheese. Heat the oil in a non-stick skillet over medium heat. Add the onion and cook, stirring, until golden and the edges are browned, 10 to 12 minutes. Add the arugula and cook until it is wilted about 1 minute. Season with salt and pepper. Place the tortillas on a baking sheet and top each one with the arugula mixture. Crumble the goat cheese over each and bake until the tortillas are crisp and the cheese is slightly melted, about 10 minutes. Let cool for a few minutes, then cut each pizza into 4 wedges and serve. I gave a homeless man an Altoids container filled with change on the train this morning. I sat down one seat away from him, and he asked me if my coffee was delicious and if my neighborhood was safe. I told him “yes.” I often pay for things small like coffee and drinks with change and I keep it in this Altoids container—this comes from waiting tables and trying to avoid loose change in my apron. Really though, after I answered him I realized, what more could I ask for on a rainy Wednesday? My neighborhood is safe and my coffee was good. I don’t even know if he realized there was change in the container, because as I was getting off the R train, he yelled at me “Are these supposed to make your breath fresh?” Oh well. I hope he buys himself his own delicious cup of coffee. David and I are in the new apartment. My camera cord is buried in the boxes somewhere, so more on those pics later. We still have some random things at the Hoboken apartment, and although it has been listed on Craigslist for nearly a month, we have no takers for our enormous couch. Salvation Army may be coming to visit us soon. Free pick-up is amazing. Oh. Life List just got a little more exciting. I drove in Manhattan by myself yesterday. Maybe it’s not that big of a deal for some people…but I felt like a superhero. I think I can do pretty much anything now. Champagne recipe in celebration of the move and being 27. Ta-da. Scoop the lemon sorbet into a tall cocktail glass. Add the gin and elderflower cordial (if desired). Top with champagne and stir. 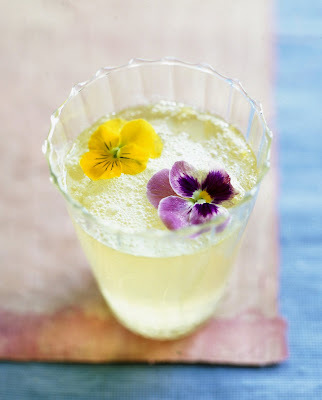 Top with edible flowers, and serve with a spoon and straw. Finally found an apartment. Moving to Brooklyn. Park Slope to be exact. After looking at countless apartments, we finally found the apartment that fit us. It’s small. I can’t seem to imagine life without IKEA, TheNest, or Apartment Therapy. Mm. Upwards organization. Organize “up.” My friend Whitney came in town this weekend and we joked that David and I will have to tack our Christmas tree to the wall. I am buried up to my nose in boxes and drooling over the prospect of warm weather. More than anything, I'm hoping to shake this cold by my 27th birthday. Yes, 27. It's going to be a good year. Birthdays on Easter Sunday must be good luck. How can I not shake this cold? The goat doctor (long story) gave me allergy medicine (along with an antibiotic) where the label reads, "Call doctor if you experience mood changes, sadness, depression, or fear." FEAR? yikes. Sounds ambiguous. Pictures of the process to come. Until then, everyone knows that moving is [fill in expletive here]. Considering my cold, I felt like I needed to cook something that would make me feel like I was at home on my parents' couch. This isn't my mom's chicken soup, but it hit the spot...and certainly made me feel better. Plus, who wouldn't want Dr. Tyler coming to their rescue? Serves 4 to 6. Time 50 minutes. Preheat the oven to 375 degrees F. Prepare meatballs by combining loose ground chicken meat (discard casings, is using sausages), bread crumbs, milk, egg, parsley, and the 1/4 cup Parmigiano-Reggiano in a large mixing bowl. Season with salt and pepper, then mix until fully combined. Using a small ice cream scoop, make balls and set on a roasting tray. Drizzle lightly with oil and sprinkle with 2 tablespoons Parmigiano-Reggiano. Roast in the preheated oven for 15 to 20 minutes, until golden brown and caramelized. While the meatballs are roasting, prepare the soup. Set a large stockpot over medium heat. Add a 2-count of oil (about 2 tablespoons), the garlic, and thyme. Gently saute until fragrant, about 2 minutes. Add carrot, onion, and celery. Season with salt and cook for 5 to 7 minutes. Pour in chicken broth and add peppercorns, the 2 tablespoons parsley, and bay leaf. Bring to a boil and then reduce heat and simmer for 25 minutes. Once meatballs are cooked, scrape them into the pot of chicken soup and add tortellini. Bring to a boil and cook for 2 to 3 minutes to allow the flavors to come together. Remove peppercorns and bay leaf. Season with salt and peppers and serve in shallow bowls. Sprinkle with parsley and grated Parmigiano-Reggiano. Garnish each bowl with a parsley sprig and serve with some torn pieces of crusty bread.